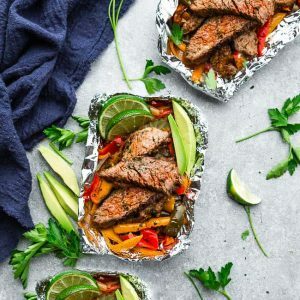 Steak Fajita Foil Packets are the perfect easy meal for summer grilling and cookouts. Best of all, they're loaded with all your favorite Tex Mex flavors and make a low carb, paleo and keto friendly meal. Combine the ingredients for the seasonings in small bowl or bag and mix. In a large zip-top bag, add the steak and drizzle with 1 1/2 tablespoons olive oil, juice from 1 lime, Worcestershire sauce and chopped cilantro. Sprinkle with 2/3 of the fajita seasonings. Seal the bag and press down to evenly distribute the flavors. (if making this ahead, you can allow the steak to marinate overnight in the fridge). Cut eight 18 x 12 inch squares of foil* and lay out on a flat surface. Divide into four piles where each foil packet has two pieces. (or line the inside with parchment paper if preferred). Divide the steak slices into each foil packet. Cut the veggies into thin strips and drizzle with olive oil and the remaining 1/3 of the seasoning mix. Divide evenly into each packet, arranging them around the steak. Place foil packets onto grill and grill for 6-8 minutes, then flip over and grill for an additional 3-4 minutes for medium (or until desired doneness). Place foil packets on a baking sheet and cook for 10-15 minutes (or until desired doneness, rotating tray once). Remove baking sheet from oven. Serve with heated tortillas with sliced avocado and your favorite toppings.